Product #1460 | SKU VIDPROREC | 0.0 (no ratings yet) Thanks for your rating! 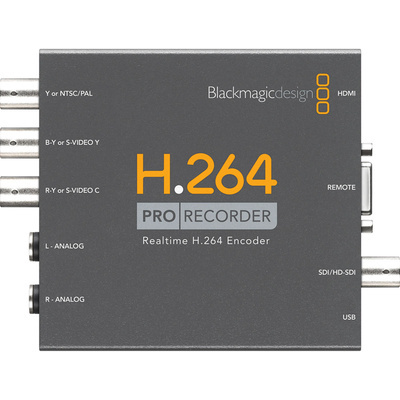 The Blackmagic Design H.264 Pro Recorder is designed for the industry professionals who require professional encoding from SDI, HDMI, analogue/component composite, and balanced audio. The flexible Pro Recorder enables you to capture old or new video formats into the same file formats used on the web, iPad, iPod, iPhone, Apple TV, and more, providing a convenient solution to capture from professional broadcast decks directly to SD and HD H.264 files. With the Media Express software, you can encode hours of content into popular online formats and batch H.264 files with an attractive user interface as well as create playlists from captured files. The software supports CMX EDL import and RS-422 accurate deck control, and is compatible with Mac and Windows operating systems. It also provides clip information such as frame size, frame-rate, colour space, format, and codec. The H.264 recorder allows you to capture high-quality videos and select between SDI, HDMI, and analogue component video inputs. Apart from capturing audio from the SDI, HDMI, or stereo balanced analogue audio input jacks, you can also connect the recorder directly to HD or SD video sources as the SDI, HDMI, and capture from HDCAM, Digital Betacam, Betacam SP, DVD players, and more. Analogue video inputs switch between component s-video and composite, and support SD and HD. The Pro Recorder allows you to save your old memories as digital files on your PC, converting old programming video formats into H.264 file format. It supports real-time scaling, and allows you to capture videos at Full HD or SD resolution.